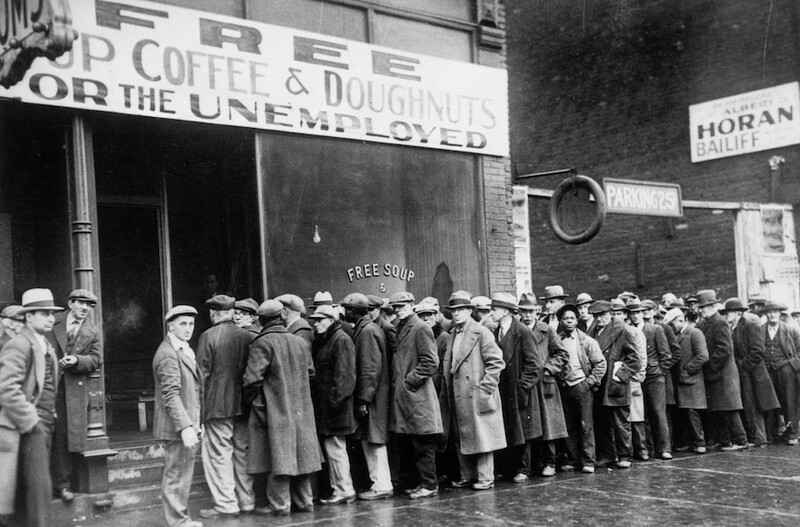 Unemployed men queued outside a depression soup kitchen opened in Chicago by mobster Al Capone. WASHINGTON (JTA) — When Holocaust historians ask what Americans knew at the time, the focus often is on the politicians and lawmakers whose votes and initiatives may have mitigated the Nazi genocide against the Jews. An exhibit opening this month at the U.S. Holocaust Memorial Museum here asks the question “What did Americans know?” On a more literal level: What did American voters, the constituents who may have done more to pressure their lawmakers to intervene, know at the time? The answer — a lot — is less than comforting to those who may harbor a sentimental belief that if only the common folk knew, their leaders may have done more. The exhibit, twisting chronologically along the museum’s first floor, is punctuated by backlit pillars with poll questions spanning the period of Nazi rule in Germany and then throughout Nazi-occupied Europe. Typical is the American Institute of Public Opinion poll from November 1938: “Should we allow a larger number of Jewish exiles from Germany to come to the United States to live?” Spin the pillar around and the answer is a resounding “No” at 71 percent. Even until after the war ended, the percentages opposing refugee intake consistently hover in the low 70s — a substantial majority. An exhibit visitor accrues a sobering assessment of how Americans reacted to the news coming out of Europe. Sympathy for the plight of the Jews is a constant, but so is resistance to the measures that might mitigate the impending genocide, including military intervention and bringing in refugees. It’s easier to pin the charge of apathy on a select group of villains, and many historical accounts in recent years have named them: State Department mandarins, President Franklin D. Roosevelt, a media hesitant to emphasize the plight of the Jews, a Hollywood system hesitant to identify Jews as the principal victims. But the exhibit corrects these impressions, or at least places them in the context of populace that did not want to engage at least until it was too late. Did The New York Times bury some of the more shocking reports? Yes, we know it did. But the wire services were unstinting in covering the truth of the Nazis’ persecution of the Jews. Thanks to the stunning results of a museum crowdsourcing initiative launched in 2016, where high school students and others researched Holocaust coverage at local libraries, we know these reports were given prominent play across the country. “You didn’t have to live in a major metropolitan area to know,” Greene said, tapping his finger on the Midwestern portion of an interactive U.S. map and pulling up a front page of the Indianapolis Star, among 15,000 articles in the database reporting atrocities against Jews as they happened. National news outlets, from Time to Cosmopolitan, covered not only the rise of Nazism, but its inherent threat to Jews. Did Hollywood erase Jews from fictional depictions of the Nazi threat? It did: Why were those refugees hanging around Rick’s in “Casablanca”? What drove them across the Mediterranean, exactly? We never know. Why is exposing the Nazi Bund in the United States so personal for Edward G. Robinson in “Confessions of a Nazi Spy”? It’s never made clear. Theories have been advanced recently to explain these anomalies — the Jewish executives in Hollywood were hesitant to appear invested in any Jewish cause, or some of them maintained distribution deals in Germany. What is made clear through the exhibit, though, is that moviegoers were not left out of the loop: If “Casablanca,” “Confessions of a Nazi Spy,” “Sergeant York” and other movies didn’t mention the Jews, the accompanying newsreels did. A screening room at the museum runs the newsreels that moviegoers would have sat through to get to the main feature — at a time when two-thirds of Americans visited the cinema at least once a week. These current affairs updates do not hold back: The Nazis’ prime victims, it is made clear in the newsreels, are Jews. The exhibit contextualizes — but does not excuse — the Roosevelt administration’s failure to rescue and allow refugees into the United States. “FDR tries to lead opinion on going to war,” Greene said, and eventually succeeds in turning American opinion in favor of intervention in Europe — quite dramatically: Even as late as May 1940, more than 90 percent of the public opposed intervention. The exhibit attempts to explain the popular reluctance to intervene, starting with stark representations of America’s own racist legacy — depictions of lynchings, coupled with restrictive anti-immigration laws passed in 1924 — and of the profound economic uncertainties seeded among Americans during the Depression that would have fueled anxieties about taking in large numbers of foreigners. Haunting the exhibit are the similar isolationist trends that helped propel Donald Trump to the presidency and have mitigated action on behalf of the Syrians under massive assault by their government and other populations in crisis. Greene said the echoes are not intentional — the exhibit is five years in the making — but are inevitable. The exhibit closes with an answer to these questions that is achingly poignant. Raphael Lemkin, the Jewish refugee who coined the term “genocide,” is quoted in 1944 as saying “All over Europe the Nazis were writing the book of death … Let me now tell this story to the American people, to the man in the street, in church, on the porches of their houses and in their kitchens and drawing rooms.